My name is Patty McWilliams. This story is about my Macy. She came to me when she was five. That was almost two years ago. 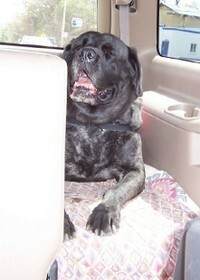 I saw her on the English Mastiff rescue website. Steve drove her in to me after Louise came and checked out my house. It was love at first sight! I had heard that her first home was a barn where she was bred for her puppies. My vet said she was overbred because she had such a big stomach, so now she has to take estrogen. Her second home was a garage where she might have lapped up some antifreeze. She is now on special dogfood because she has a bad kidney. Steve thought she just had a bladder infection when he brought her. He said I could give her back for another healthier dog, but I said I was keeping her. Through Louise and Linda, I am able to keep stylish diapers on her in the house. Her leaking has greatly improved with the medication and food. Louise had said she would make a great therapy dog. We started her in a therapy group and Macy did very well. Her gentleness and affection showed through because she would never leave my side. Everyone asked if she was professionally trained. But that is just the way she is. It seems Macy appreciates being with me. I have a rare disease that got worse, so I had to quit the therapy group because I'm on chemo and heavy duty steroids that lower my immune system. It causes nerve and organ damage. I lost my hearing in one ear and now I have nerve damage in my feet. I can walk about ten minutes, before my feet stop working right. Then I have to find a place to sit for awhile. Since Macy never leaves my side, I made her my service dog. She keeps me steady till I can sit down. Macy loves this job because she can go everywhere with me! It seems like fate. I helped her and now she helps me. She is always well-behaved when we go into stores. I am so proud of her. To see more pictures of Macy, please click here and here. Sadly, Patty died in the spring, when Macy was around 11 years old. Macy was in great health for such an old girl. She went to another loving home, where she spent three weeks enjoying the company of some other fine mastiffs and people, before she died unexpectedly. Although she seemed happy and well-adjusted, we will never know how she felt to be separated from Pat. Pat was my friend and I am comforted knowing those two are together again.